If you know me well, then you know that I LOVE a good deal. I call myself a red tag addict-- I seriously am drawn to red tags. When it comes to kids clothes, my love for a good deal is no exception. In fact, I would say that about 99% of all of my boys clothes is bought used at a serious discount. It's a very, VERY, VERY rare occasion that I purchase anything, even if it's new, for over $5 a piece. I just don't see the point in buying kids clothes new since they grow out of it so fast anyway. So for my red tag addict days, today was like Christmas. 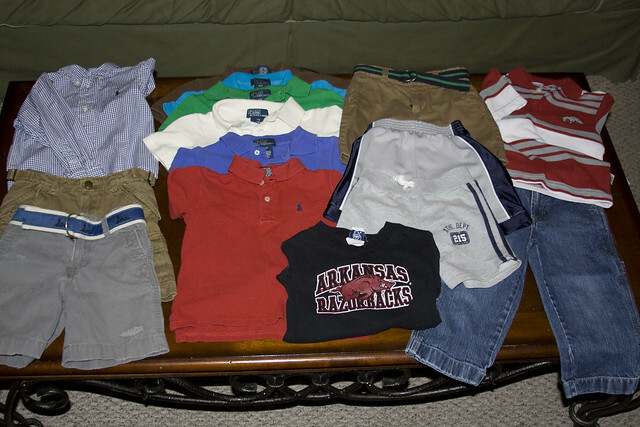 Today was the semi-annual consignment sale that I get most of the boy's clothes. I do a few things for the sale, like working a shift during the consignor drop off period, and have a yard sign, so that I can get into the sale before the general public. Today I got a babysitter, headed out and got there right before the doors open. I was actually a little nervous because when I worked on Saturday night both of my boy's sizes were pretty low. Thankfully between then and today they stocked up, and I was able to score some really cute stuff for both Brayden and Connor. I thought I'd share with you guys what I got! The most important item I was looking for was summer shoes for B. Crocs to be precise. I have had a really hard time swallowing the fact that I might have to pay over $20 for crocs. Even the off brand ones are close to $13, which is just a lot for recycled rubber! Thankfully when I was working on Saturday I happened to come across the boys shoes and noticed several pairs of crocs in B's size... JOY! So I hit up shoes first. 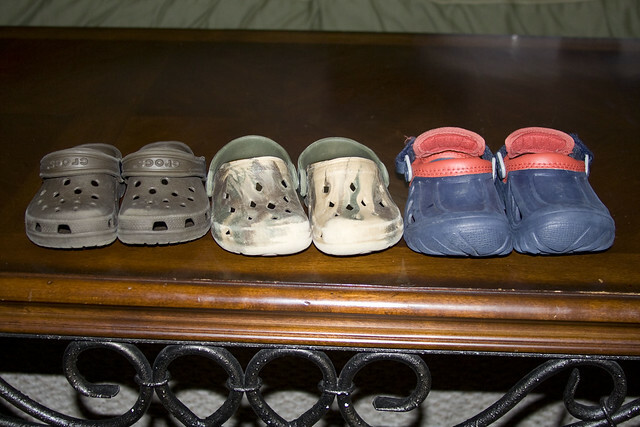 I scored 3 pairs of crocs (two name brand, 1 off brand)... all for $13.50 total! B LOVED his new shoes! The minute he saw them he said "shoe, on!" and then once they were on he would do a little stomping dance and say "Me cool!" haha! After shoes I sorted through what seemed like MILLIONS of 2T-3T. I know some of you are probably saying "I could never do that!" And truth be told, it's not my favorite thing in the world to sort through hundreds of kids clothing items. But I believe that it's my job as the homemaker to make our dollar stretch as far as it can go. I think that by doing so shows my husband how much I value how hard he works for our family, and that I don't take for granted even 50 cents of the money he brings home to support us. One way I stay focused through having to sort through the clothes racks is to know exactly what I need. 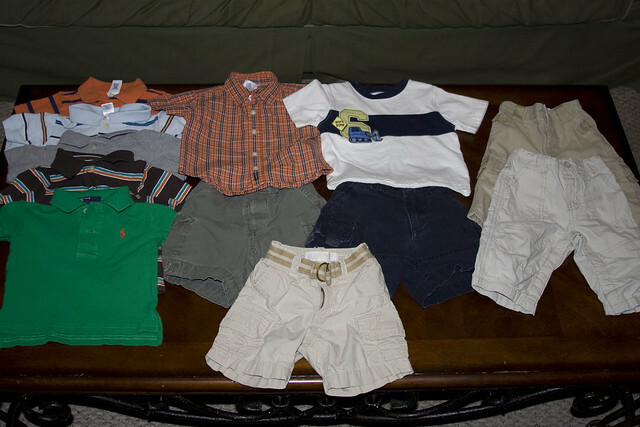 So I have a list for each boy, listing the size and how many of a certain type of clothes (ie, 3 polo shirts, size 2T, solid color). I was really surprised at the deals I found for B. I ended up getting him ALL ralph lauren polo shirts-- and at most I spent $5 per shirt (well, I did spend $6.50 on a long sleeved Ralph Lauren shirt, but it looked brand new and it was too cute to pass up). I then got him 3 pairs of khaki shorts, for at most, $5 per pair of shorts. I even scored some GREAT looking baby gap jeans, for $2.50! My favorite find was a red, gray and white striped polo shirt that had a Razorback on it... for $5... and it was BRAND NEW WITH TAGS! Hog stuff is hard to come by around the consignment sale, and when it does come it is normally still pretty pricey (we love our Hogs around here! ), so I was floored that someone sold the shirt for so cheap! The only thing I was disappointed about were the jammies, which were hard to come by. I did find a few pairs though, so he has enough to get him through the beginning of summer. I had to search for 6-9 month and 12 month clothing for Connor man (I know, I know, he's a chunk!). They didn't have a great selection of shorts for C-man, so I might have to make a trip to Children's Place, but other than that I was pleased with what I got him. 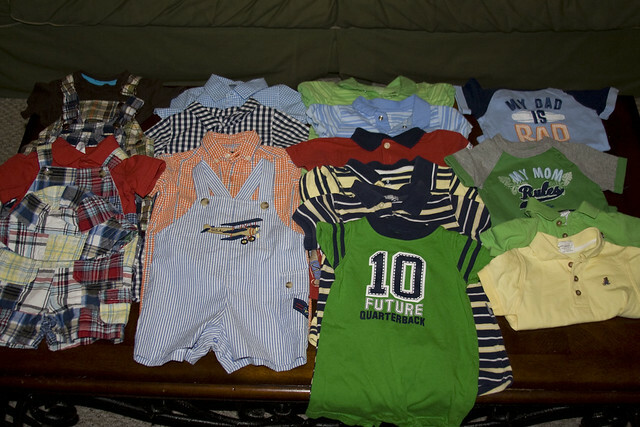 ALL name brand stuff-- Carters, Polo, Old Navy, baby gap and Osh Kosh, and the most I spent for any item for Connor was $4 a piece! I bought lots of rompers and shortalls, since those are so easy to put on and off and they still look cute. This is all of the shirts, shorts and pants I got for C. The two pairs of pants are baby gap and I got both for $3 a pair! 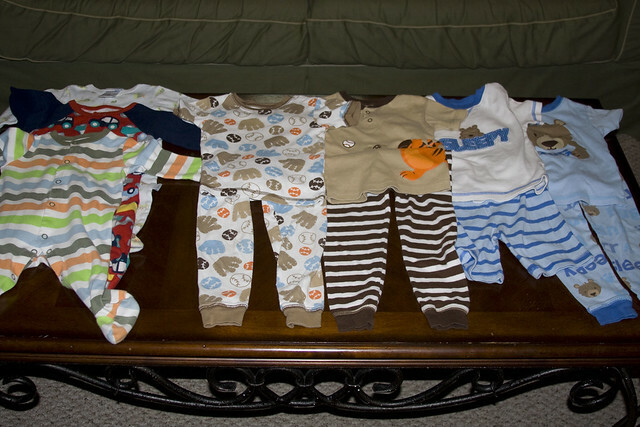 from left to right: shortalls (2 pairs are Oshkosh), then the nicer cotton rompers-- the orange seer sucker romper is Ralph Lauren, then Carter's rompers-- more casual than the ones on the left, and on the far right are the onesies-- the one on the top right is my fave, it says "my dad is rad" both that one and the one below it that says "my mom rules" are baby gap, and i got them both for $2 a piece!). The only thing not pictured is a dump truck and a few little CAT construction trucks (small like hot wheels, but there are excavators, dump trucks, etc) that I picked up for B to play with outside, and some undershirts I found for B (they're just plain white Hanes undershirts... I got a pack of 5 for $4!). All in all I spent a total of $180.50 for both boys. The only thing I still really need are one more pair of shorts for C, and MAYBE some pjs for both boys. I'm so grateful that God has given me an opportunity like this sale where I can find great deals and really stretch my dollar. I am certain people look at my boys and think that we spend a fortune on their clothes, and am so happy when I can say that most outfits are less than $10 total. I'm sure yall will be seeing all of this clothes in lots of pictures this summer!